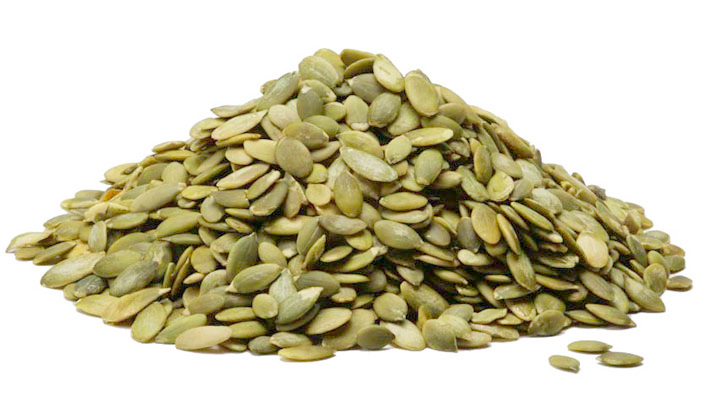 Pumpkin seeds are widely used in culinary, due to the high content and variety of nutrients they contain. Pumpkin seeds have the largest amount of iron and magnesium among all seeds. They are rich in vitamins A, C, K, E and group B vitamins - B1, B2, B5, B6, B9. All are powerful antioxidants and help fight cell aging. From the minerals they have also phosphorus, potassium, calcium, zinc, copper, manganese, selenium. Pumpkin seeds contain essential omega-3 and omega-6 fatty acids, and the cocktail of nutrients and minerals is supplemented by a very rare ingredient delta-7 styrene and amino acid L-tryptophan, which helps to sleep better and avoid depression. They are one of the best sources of protein and fiber.